Dear our valued users, long time no see! Nami is back with you guys! 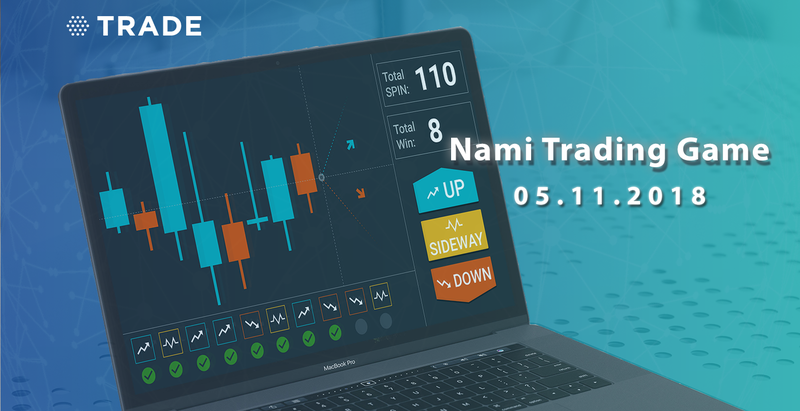 On November 5th, 2018, Nami will release a new product called Nami Trading game. This is a simple trading game where you can evaluate your analysis skills and compete with other players in order to win up to 1 BTC per week. For the time being, beta version of Trading game is live on https://nami.trade/spin/game. Nami team welcome all constructive comments from your very first experience with the game for further progresses. At the same time, Nami is still working on developing new functions and improving UI/UX, aiming at a better gaming performance. How to play: you need to choose the direction UP or DOWN or SIDEWAYS of the next candlestick on BTCUSD chart price. Gamer needs 1 SPIN for 1 turn. What’s your rewards: up to 1 BTC per week for the winner who makes 15 consecutive right choices (equivalent to 15 levels in this game). Additionally, for each of your correct direction, you will receive prizes in tokens (DOGE and XLM, for example) in your respective level. The better you perform, the larger amount of tokens are accumulated and multiplied. How to get SPIN: earn free SPIN by completing Nami missions or exchange SPIN easily and instantly on https://nami.trade/spin/buy. For more details, please visit here. On beta version, weekly reward 1 BTC is temporarily not available. However, gamers still get their tokens (DOGE and XLM) rewarded after each level. In order to join the game, you just need to install Meta Mask or Trust Wallet and log in nami.trade. For instruction on how to install Meta Mask and Trust Wallet, visit here.